Everyone's now aware of 3D printing — they’ve read about it in the papers, on blogs or seen it on TV. The mentality now seems to be that, in the future, we'll be able to download our products or make them ourselves with CAD programs, apps and 3D scanners, then just print them out, either at home, or in localised print shops. Which in turn will supposedly decentralize manufacturing, bringing it back to the West. But like the cupcake, Daft Punk’s latest album, or goji berries, 3D printing is severely overhyped — and I should know, because it’s what I do for a living. All day, every day, I operate machines and speak to both the public and the industries about what their requirements are. In the last two years, I’ve made over 5,000 models and answered over 10,000 emails from major corporations to crackpot inventors, designers to hobbyists. So, I feel that I’ve had a good deal of interaction with all levels of customers, and in turn, their awareness of 3D printing. …people expect the world from 3D printers. This has been printed in one piece, which is in itself phenomenal to anyone who knows anything about manufacturing. However, it is made purely from a plaster powder and some inkjet ink for colouration. Joe Public on the other hand may see this and think it’s made from a combination of metals, plastics and rubbers. Sadly this is not the case. The thing is about as functional as your mom’s figurine collection. Other images show gloss plastics with complex shapes that have been produced on machines worth hundreds of thousands of pounds, and then have been meticulously post-processed for hours, days—even weeks—at great expense by highly-trained professionals. People see images or videos of 3D printed mechanisms, 3D printed tables, material 3D prints, and of course guns—and then they see that they can buy one for under $800 and think "WOW!" I can do all this at home. This is the future! And it is, in some respects — it’s going to open so many things up in the world. But that doesn’t mean to say that you will do it yourself or that it will decentralize manufacturing, like the hype seems to suggest. The materials are also much more expensive than buying just raw material, with the cheapest being about $50 per kg, ranging up to $500 for some resins. So you’re not really making a saving here, I’m afraid to say. Sadly for every request we have for a full sized Daft Punk helmet, there’s an equal number of disappointed Daft Punk fans out there, when they find out how much it will cost to build. Speed: Many people say that 3D printing is quick — this is another omission of a suffix — this time ‘for manufacturing processes’. Items regularly take hours to print, even days. You can speed this up by making the layers thicker, but as soon as you do this, you lose your surface finish quality. The notion of ‘but it’ll get faster in the future’ is not necessarily true, as we are limited by the chemical properties of materials such as ABS and PLY — these materials can only be extruded so fast, and at such a rate before you start to destroy the properties of the part. This is happening with the top-end machines right now for FDM (Fluid Deposition Modelling). Usability: This is huge. To print something, you need a CAD model. Getting that is hard. Really hard. When you write a letter, you don’t just click ‘print,’ do you? You have to actually type it and check it for mistakes. Now this is the same for 3D printing, but a million items harder. So how can you do this, I hear you ask? 1. Learn CAD: Advisable, but difficult. You not only have to learn how the program works (it’s a bit like Photoshop; give it a week and you can draw something, but give it three years and you’ll learn it inside out), but you also have to learn how to design. You need to acknowledge things like tolerances — i.e. a 10mm shaft will not fit in a 10mm hole. 2. 3D Scanning: Great if you only want to scan the outer surface of a part (they cannot scan the inside of items), and if you don’t want any driven dimensions. The idea of scanning a broken part and 3D printing it is a massive over-engineered approach to replacing a part when there are inventions like superglue or silicone moulding (much better smoother and stronger way to produce duplicates). Also it’s not as easy as it sounds, and not cheap either. You can get something like an Xbox Kinect and rig it up as a scanner; that is if you want an incredibly abstract version of what you want, or you can get a pro to do it at a cost. 3. Downloading 3D files: Every day a new 3D model library opens up on the internet. These instantly seem to get populated with the same 3D files that are on all the other sites. These files are 99% unmoderated, meaning that they are not guaranteed to be 3D printable. Many of them are made for animation/rendering and are flat surfaces with images projected onto them. These aren’t printable. Even the major 3D printing libraries are full of files with errors and/or have been designed with little respect to the capabilities and cost of 3D printers. 4. Photo-based apps: Like scanning, only worse. Machine range: So you can 3D print in hundreds of different types of materials, but can they all be done in your living room? Absolutely not. People seem to forget that there are loads of different types of 3D printers, all of which have advantages and disadvantages. FDM, the main consumer form of 3D printers, extrudes ABS or PLY in a relatively safe manor, with the materials cooling down quickly, meaning the parts are safe to touch straight off the machine (and leave little in the way of mess). This is definitely not true for any other type of printer. 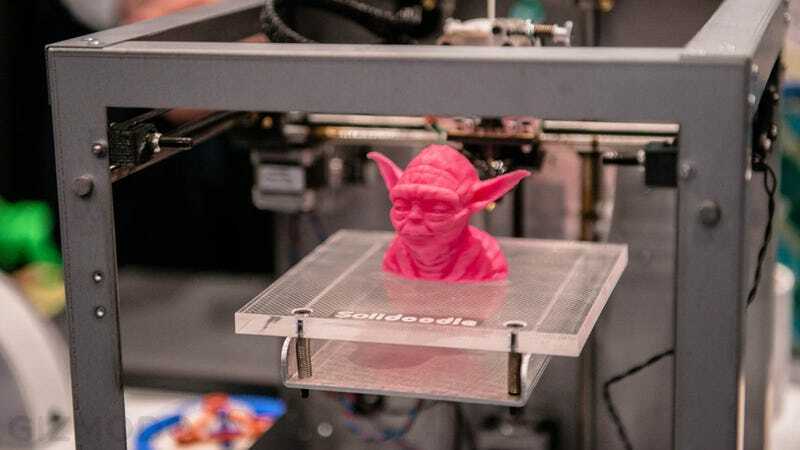 Resins, though higher detail, are really messy and expensive; powder-based printers are really messy, and sometimes explosive (never make the 3D printed gun on a powder-based printer); others operate at high temperatures or produce masses of waste. This basically leaves us with FDM (which by the way has the worst surface finish) as the only really suitable technology for the home. Materials: Generally speaking, you can only print in one material, and this is generally a plastic. Now look around you…how many items are in your room that are made up of a single piece of plastic — just plastic, nothing else? I can see two things; a cup and a lens cap. The cup cost 5p. The lens cap was expensive, but requires very high accuracy and acute clips (not great on a 3D print thanks to the layers causing weaknesses). Would I 3D print it? No. Most items in the house are made up from multiple materials, and most of them are both metal and plastic. Those two cannot be made together as their melting temperatures are hundreds, if not thousands of degrees apart. I’d not like to smelt in my living room either. A great analogy I once read was the comparison of 3D printers to the bread making machine. In the '90s, bread makers suddenly became affordable and everyone got one; they then went and spent $4-7 on all the ingredients to make bread. They followed the instructions and left the bread cooking overnight. In the morning they came down to the wonderful smell of freshly cooked bread; bread that they had created using a machine, some materials and some time. They smugly sat eating their bread thinking "this is the best loaf of bread ever". Two weeks later the bread machine is in the cupboard and they’ve gone back to buying their carbs from the shop. I’d say that 99 per cent of the population would rather go out and buy a loaf of bread for $1, rather than making one for $3, despite it being more rewarding. After all that, I bet you think I hate 3D printing, and that you think I think it has no future. Not at all. I’m obsessed with it, and know it has a huge future — I wouldn’t be committing every day of my life to it if I didn’t wholeheartedly believe this. The future for consumer 3D printing lies in the potential for people to create, invent and share ideas. Since starting this business I’ve helped hundreds of designers make their ideas come to life, and am proudly watching as they arrive in the marketplace. These products are now being mass produced and not 3D printed, so the quality is much higher. 3D printing will continue to grow in areas like the prototyping market, low-volume production runs (on very high-end machines), medical, aerospace — the list goes on. But as an everyday household object? I’m not convinced. We are still firmly in the honeymoon period with 3D printing — we’re in awe of it and what it can do. But when you look at just the parts produced and not the way they were produced, printed parts are a long way behind in terms of quality, and when there often is no cost advantage, Captain Everyday will always go for the mass-produced one. Boy, do I hope I’m wrong, though. Founder of 3D printing company 3D Print UK, Nick Allen and his team work in South London, producing thousands of models for individuals and corporate clients (and even Gizmodo UK readers for their ad-hoc design competition).